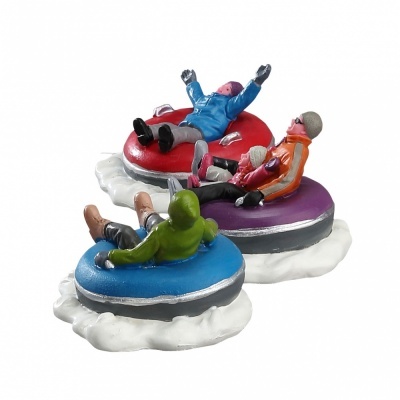 Lemax Tubing Family - Table Accent- Set of 3 depicts a family fun time riding inflatable doughnuts down a snowed landscape. A delightful miniature Lemax table piece to compliment your miniature Winter village display. Scaled and themed for placement in and amongst your Lemax scene to add a modern twist to a Winter fun setting. 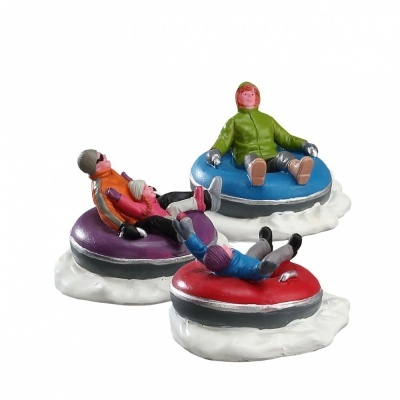 These multi-figurine pieces are placed on three individual snowed bases. Tubing Family recently joined the growing Lemax Vail Village collection in 2017.